The line was opened in 1985 and continued to expand in the 1990s. Runs east to west from Černý most to Zličín. Currently it is the longest line in the network with 24 stations and 25.6 kilometres (15.9 mi) of track. Černý most Terminus of Line B, serving the housing estate of the same name. Connection to buses (181, 202, 220, 221, 223, 240, 250, 261, 273, 296), regional buses ( 303, 304, 344, 346, 353, 354, 367, 379, 398) and night bus 512. You can also catch here special bus lines ( H1 and IKEA2 ) taking you to the Centrum Cerny Most shopping center and IKEA. Rajská zahrada Connection to buses (181, 202) and night bus 512. You can also catch here special bus line – H1 taking you to the Centrum Cerny Most shopping center. Hloubětín Connection to tram 16 and 25, buses (110, 186, 273), night buses 512 and 559. Kolbenova Connection to tram 16 and night tram 54. Vysočanská Connection to tram 16, buses (136, 151, 158, 177, 183, 195) and regional bus 375. Českomoravská Connection to tram 8, 16 and 25, buses 151 and 158, regional bus 375 and night tram 52. Get out here to get to the O2 Arena ( sport events and concerts ). Palmovka Connection to tram 1, 3, 8, 10, 12, 16, 25, buses ( 109, 140, 185 ), regional bus 302, 603 and night tram 52, 53, 54, 55 and night buses 503, 513. Náměstí republiky Its two exits serve the Republic Square (Náměstí Republiky) area and the Masaryk suburban railway terminal (Masarykovo nádraží) respectively. Connection to tram (5, 8, 24, 26) and night tram (51, 54, 56) and historic tram line 91. Bus 207 or night buses 505 and 511. Get out here to see the Municipal House or visit some of many restaurants and bars in the neighborhood. On Republic square you can find also big shopping mall Palladium. Můstek (map) Lower end of Wenceslas Square. Transfer to the metro line B (yellow). Connection to trams passing through Wenceslav square (3, 9, 14, 24), night trams (51, 52, 54, 55, 56, 58) and historic tram line 91. Národní třída Connection to trams (6, 9, 18, 22 ) and night trams (53, 57, 58, 59) and also historic tram line 91. Karlovo náměstí The station has two exits, one leading to Charles Square and the other to Palacký Square (Czech: Palackého náměstí), both of which are major tram hubs. Connection to tram (3, 4, 6, 10, 16, 18, 22, 24) and night trams (51, 52, 53, 54, 55, 56, 57, 59), buses 176, 291 and night bus 510. 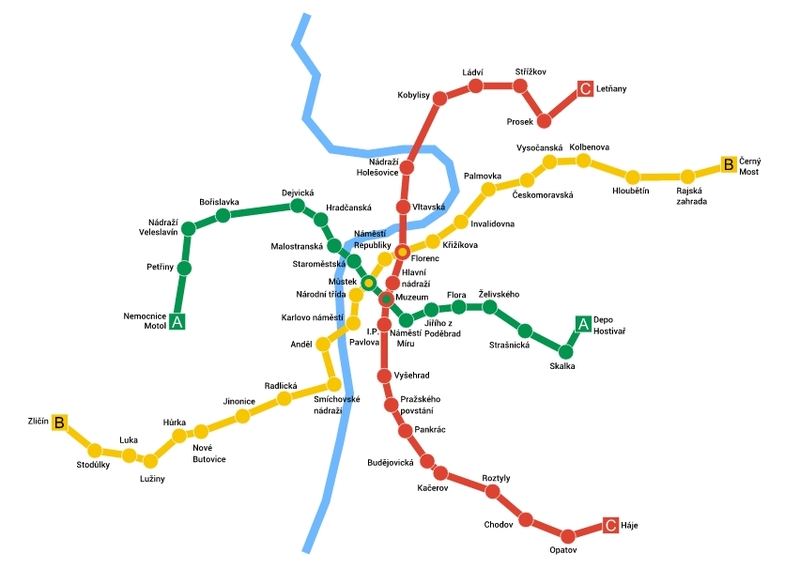 Anděl Connection to tram (4, 6, 7, 9, 10, 12, 14, 16, 20) night trams (54, 58, 59) buses 167, 191 and night buses (501,508). Anděl station has two exits, leading to the two underground vestibules. One vestibule is directly in the Anděl neighborhood, next to the shopping mall and the other is at Na Knížecí, a big bus station where many buses leave for other parts of the city. Smíchovské nádraží Connection to tram (6, 12, 14, 20), night tram 54, buses (105, 118, 125, 129, 196, 197, 241, 244, 253), regional buses (314, 317, 318, 320, 321, 334, 338, 361, 390) and night buses 501 and 507. It serves the Smíchov railway station, major railway station on the Czech national rail network. Radlická Connection to tram 7 and night bus 508. Jinonice Connection to buses 137, 176 and night buses 501 and 508. Hůrka Connection to the bus 168 and night bus 508. Luka Connection to the buses (174, 214, 225, 230, 249, 256, 301, 352) and night buses 502 and 508. Stodůlky Connection to the buses 214 and 225. Zličín Connection to bus number 100 to Prague airport, and other buses (164, 180, 257, 264) and regional buses (306, 307, 308, 309, 310, 311, 336, 347, 358, 380, 384, 602, 607). You can also catch here special bus lines ( IKEA and GLOBUS ) taking you to the Metropole Zlicin shopping center and IKEA. Zličín, Stodůlky, Luka, Lužiny, Hůrka, Nové Butovice, Smíchovské nádraží, Národní třída, Florenc, Vysočanská, Kolbenova, Hloubětín, Rajská zahrada, Černý Most.